Accuracy is a measure of the magnitude of error between the result of a measurement and the true thickness of the item being measured. An accuracy statement predicts the ability of a coating thickness gage to measure the true thickness of a coating to be measured. Accuracy statements provide the performance capability across the full functional measurement range of the gage. Often the measurement range is split into two sections ranging from 0 to a fixed value; and then everything greater than that fixed value (up to the gage's measurement limit). Accuracy statements frequently include a fixed portion that remains constant across the measurement range, plus a variable portion that is related to the measurement result for a particular thickness. Such accuracy statements are critical since those with no fixed value imply an exact measurement at zero. To prevent conversion errors, accuracy statements are stated in both their imperial and metric equivalents. The following figure identifies a sample accuracy statement for a DeFelsko gage. Precision is an indicator of the closeness between repeated gage readings. Readings do not have to be close to an expected or true value to be considered precise, they just need to be close to each other. Figure 1 is a representation of accuracy without precision. The thousands of readings would balance out to an average (mean) of close to the center of the target. The small circle in the center represents the specification of the part being measured. By taking multiple readings we can statistically improve our knowledge of the parameter being measured. This is a recommended process when using coating thickness gages. The spread of the readings represents the range of readings and should be within the accuracy range of the gage. The gage shown has an accuracy range that is wider than the specification of the coating being measured. This is not a good measurement situation. It would be equivalent to measuring a coating with a desired specification of ± 0.1 with a gage that has an accuracy of ± 1.0. The long-term average of the readings will be close to the center of the specification, but the number of measurements required would not be practical for a real life application. It is for this reason that the gage should be more accurate than the specification. Figure 2 demonstrates precision without accuracy. The readings are very precise and grouped but are far from the true value at the center of the target. 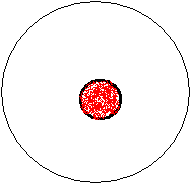 The distance from the center of the target to the center (average) of the readings is referred to as the bias of the instrument making the measurements. An example with a coating thickness gage is when it always reads higher or lower than the true thickness. The gage may be consistent (precise) but is not accurate. Bias can result from the gage itself, wear, damage, or due to a particular substrate and coating being measured. 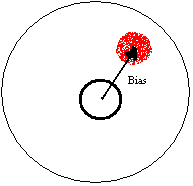 While not desirable, bias can typically be fixed by performing a calibration adjustment such as zeroing. Figure 3 demonstrates precision and accuracy at the same time. This represents a gage that has an accuracy that is equivalent to the specification of the part. 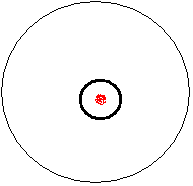 The center of the target is the same diameter as the group of readings. This is an Uncertainty Ratio of 1:1. This is still not an ideal situation since a reading outside of the specification circle may be due either to the limited precision of the instrument or an actual outlying measurement. A more ideal situation is Figure 4 where the precision of the readings is a tighter circle that is still located in the center of the specification circle. In this instance a reading that falls outside of the specification is assured of being an outlying measurement. Uncertainty is the doubt (potential measurement error) associated with the validity of a measurement. In terms of a coating thickness gage, uncertainty identifies the measurement errors that could reasonably occur when measuring the thickness of a coating. This may include the gage uncertainty (repeatability based on gage accuracy at the thickness in question), operator uncertainty (reproducibility based on ability of the operator to influence the readings), temperature and humidity uncertainties (impact of environmental conditions), as well as other application specific uncertainties. A common means for combining these uncertainties is the sum of squares method shown in the following formula. The user typically avoids the complicated process of estimating process uncertainties by using an accepted uncertainty ratio rule such as 4:1 (as per ANSI Z540-1 and MIL-STD-45662). A 4:1 uncertainty ratio states that if their gage is at least four times more accurate than the specification, the user may skip the uncertainty calculation process. To meet the uncertainty ratio, DeFelsko utilizes high accuracy calibration standards throughout all manufacturing and calibration processes. To further ensure the adequacy of such uncertainty ratios, our calibration procedures establish criteria to minimize relevant sources of variation such as temperature and humidity. A customer wants to measure a coated product. The coating thickness is expected to be 10 mils. The specification of the coating application is 10% or ± 1 mil. The acceptable range of readings is thus 9 to 11 mils. The accuracy statement for the instrument is ±(.1 mil + 1%) of the reading. Therefore, the instrument accuracy of the reading to be taken is ±[.1 mil + (.01 x 10 mils)] = ± 0.2 mils. 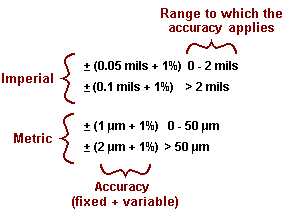 Therefore the specification versus instrument accuracy is calculated as 1 vs 0.2. This is equivalent to a 5:1 uncertainty ratio, which is typically acceptable for measurement applications. In coating thickness measurement, the resolution of an instrument is the smallest increment that the gage displays. Resolution for DeFelsko instruments ranges from 0.01 to 1 mil (0.5 to 20 µm) depending on the thickness and type of instrument. All DeFelsko gages have the ability to display greater resolution since the internal gage readings and subsequent calculations are made to many more decimal places. They are subsequently rounded off and presented to the user based on the resolution setting of the gage. Though the readout of the gage could be changed to show several more digits of resolution, such an increase would not make the instrument more accurate, it would simply increase the apparent variation in readings. 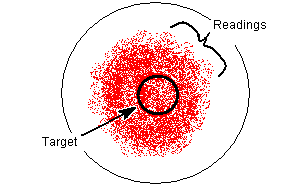 Repeatability and Reproducibility (R&R) are critical factors closely related to precision and accuracy. It helps to think of repeatability in terms of how capable the gage is of providing the same reading to a single user when measuring a specific sample. The ability for different users to get the same reading when measuring a specific sample is referred to as reproducibility. Statistical methods such as Gage R&R studies exist to compare the repeatability and reproducibility of different instruments. Due to the impact on Gage R&R studies, several critical factors should be considered when evaluating instruments. 1. Variation within the sample being measured. When the coating and substrate have significant variation due to factors such as roughness, the variation must be accounted for as part of the R&R study. Paint Application Specification No. 2 (PA2) from the Society for Protective Coatings (SSPC) specifically states "Magnetic gages are necessarily sensitive to very small irregularities of the coating surface or of the steel surface directly below the probe center. Repeated gage readings on a rough surface, even at points very close together, frequently differ considerably, particularly for thin films over a rough surface with a high profile." Variation may be minimized by fixturing the sample and probe to ensure readings are taken at the same location, however the user must still ensure there specification and corresponding repeatability targets are reasonable for the application. 2. Resolution of the readings. An instrument without a "high resolution" feature to provide the user with more significant digits may appear to provide more repeatable results. For example an instrument with one digit resolution may provide the following readings (2.1, 2.1, 2.1). The same instrument in "high resolution" mode might read (2.06, 2.14, 2.07). Though both sets of numbers are valid at first glance the first set appears far more repeatable. Conversely consider the following two sets of readings (2.1, 2.2, 2.1) and (2.14, 2.15, 2.14). In this instance the rounding function has a negative impact on the repeatability of the "low resolution" mode. 3. Accuracy of the actual measurement. Given a sample of known 2.00 thickness, consider readings from a (precise) instrument 2.21, 2.22, 2.21 versus a second (accurate) instrument 1.96, 2.04, 1.97. If the true value of the thickness is known to be 2.00 which instrument is more practical for use, the precise instrument with obvious bias, or the accurate instrument with slightly more variability? These factors are critical when selecting a coating thickness instrument for any application.